There are two primary categories of level measurement, i.e. Point Level and Continuous Level measurement. Most units sold fall into the first category, point level. However it is the continuous level category that provides the greatest amount of information and usually that means a higher cost of purchase. In the area of continuous level measurement of liquids there are several types of sensors that can be used. One of the most common of the types of continuous level transmitters are the float level transmitter. These devices use the principle of buoyancy as one of the primary means to determine the level of a fluid as it changes on a continuous basis, hence the name float level transmitter. There are two types of float level transmitter units, we explain them both in this post. The two float level transmitter technologies available today for measuring liquid level are magnetostrictive and magnetic float level transmitters. Both magnetostrictive and magnetic float are float level transmitters. Magnetostrictive separates itself from the magnetic float type of float level transmitter by being both much more accurate, more expensive and more capable in terms of the application and use. the moving magnet as a result of changing fluid level is precisely determined by measuring the elapse time between the application of the current pulse and the arrival of the strain pulse. As a result, the magnetostrictive level transmitter is able to create a reliable level measurement system that is fast, accurate and repeatable. The output(s) of the transmitter reflects the level of the liquid or the distance of empty space. The magnetostrictive float level transmitter also routinely offers the ability to equip the level transmitter with two floats and multiple outputs so that these float level transmitter devices can be used for interface and top fluid level measurement easily. Magnetic float level transmitters are the second type of float level transmitter. These units use the principle of buoyancy as well. However, their principle of operation uses a continuous series of reed switches located inside the stem along its entire length. The position of the reed switches in relation to each other (the spacing between reed switches) can be such that usually one of two resolutions or accuracy are available. Typically either 1/4″ (6.35mm) or 1/2″ (12.7mm) separation or resolution is offered. Reed switches respond to the presence of a magnetic field. When the magnetic field is present the switch is closed, when absent it is open. Therefore with a magnetic element contained inside the float, as the float travels up and down the stem of the transmitter, the resistance of the wire inside the stem varies. The primary output is therefore a 3-wire resistance output. However, usually these float level transmitter units are equipped with a transducer inside the electronics enclosure to convert the resistance signal to a 4-20mA output. 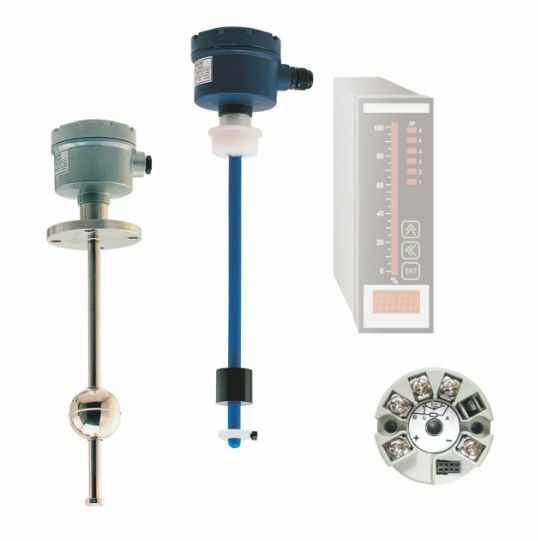 Magnetic float level transmitter units are typically fitted with a single float, therefore interface measurement along with the primary top fluid level measurement is not possible, though interface measurement is possible depending on the difference in specific gravity between the two liquids and whether an appropriate float can be chosen for buoyancy on the bottom fluid, while it sinks in the top fluid. 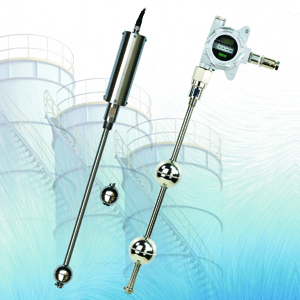 Aplus Finetek offers both of these two types of float level transmitter instruments. For a closer look at the float level transmitter product lines you can visit the web pages; FG Series Magnetic Float Level Transmitter and EG Series Magnetostrictive Level Transmitter. For more information on the EG and FG series of float level transmitter instruments you can contact us at 815-632-3132.